A smaller and lighter version of M. myotis, the Lesser Mouse-eared bat has a narrow, pointed snout, and brown-grey dorsal fur. Its ears are short and narrow ears and some individuals can exhibit a paler spot of hair between them. Unlike the M. myotis, this species favours warm and open habitats, such as damp meadows, pastures and other extensively farmed areas. Along the northern distribution area, attics are used as summer / maternity roosts, which can be shared with Rhinolophids and Miniopterus. During winter, the species may form clusters in underground sites. The diet of M. blythii comprises of bushcrickets, crane-flies and grasshopers; these are caught primarily through gleaning techniques. This species is considered an occasional migrant due to a few recorded distances of 100 - 150 km. More often than not, it has a sedentary behaviour and its summer an winter roosts are usually 15 km apart. 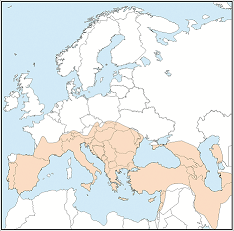 M. blythii can be found in southern Europe, southern parts of central Europe. It has also known to be widely distributed in non-arid parts of southwestern Asia and Asia Minor. This species can be affected by changes in land management and roost disturbance (both in caves and buildings).